dandelion Wine to secondary fermentation. a little lighter in colour. Well, finally, after what seems like months of babying, nurturing and feeding my dandelion wine during its primary fermentation, stretching it out for many weeks more than it is usually called for, I have given it its final racking and taken it down to the cool basement to sit for the next few months. I hope the only work I have left to do on it now is racking it every few weeks till it is bottled, just to make sure there’s not too much Dandelion Wine must on the bottom and to keep its flavor and color clear. I did take a bit of a side road making this dandelion wine when I accommodated the 20 L carboy from a 14 L original batch of wine. I fed it slowly with the leftover Angelica syrup till the syrup was gone. This added extra flavor and a touch of Angelica fragrance to the dandelion wine which seems quite complementary. However, only the final tasting, after the bottles have sat for months, will really tell me if it’s a success or not. All in all I’ve added about an extra 1kg of sugar to the original recipe with the extra 6 liters of water. I will adjust that recipe accordingly now. People have asked whether it is possible to add sugar and/or water during primary fermentation, so the answer is, obviously, yes. I think, realistically, there is a set amount of sugar that each type of yeast can handle. Once the yeast has turned it into the highest percentage of alcohol it can tolerate, the yeast will cease to work and the rest of the sugar is left as sweetness in the wine. Whether that sugar is added all at once at the beginning of the primary fermentation, or added slowly over the course of weeks, may make no difference. If I had not decided to stretch my 14 liter batch to 20 liters, the original amount of sugar would have sufficed and given a very dry wine. However, that being said, I would not have had that delightful extra, classic, flavour of Angelica in my Dandelion Wine if I had not stretched out the primary fermentation for so long. 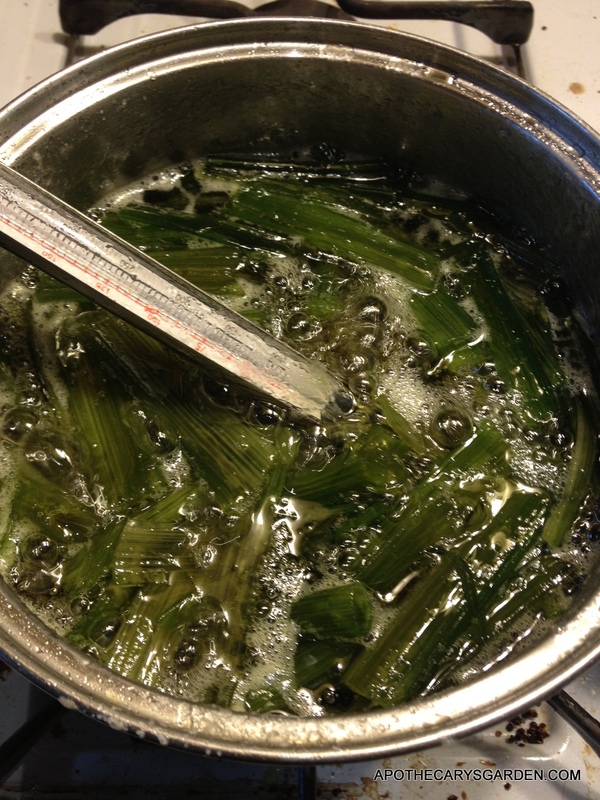 Having made a note in my formula book, I will be better prepared next spring and synchronize the making of Candied Angelica Stalks so the left over syrup goes directly into next years dandelion wine. I will make it part of the recipe. 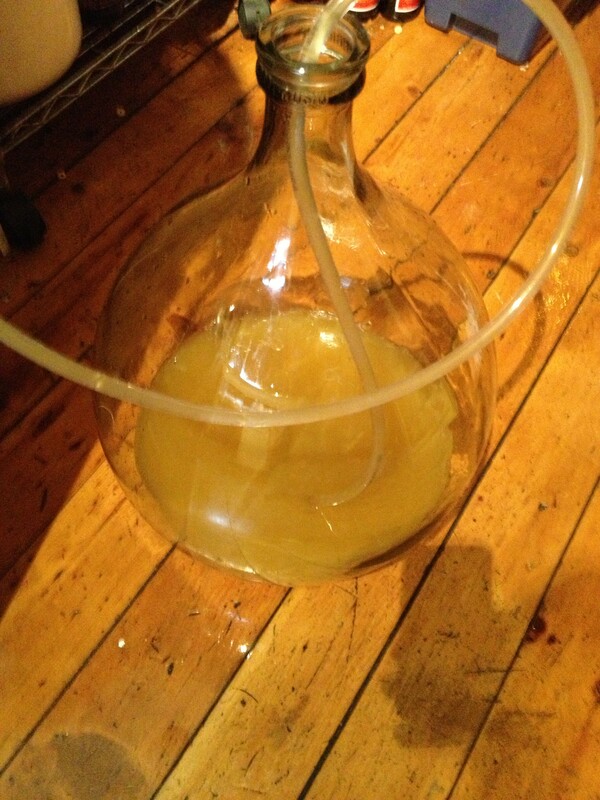 Dandelion Wine working at Primary Fermentation. Fizzing, hissing and in general purring contently like a cat. The colour was intense! adding 6 liters of water to it toned it down a bit, but the colour is still lovely and rich. 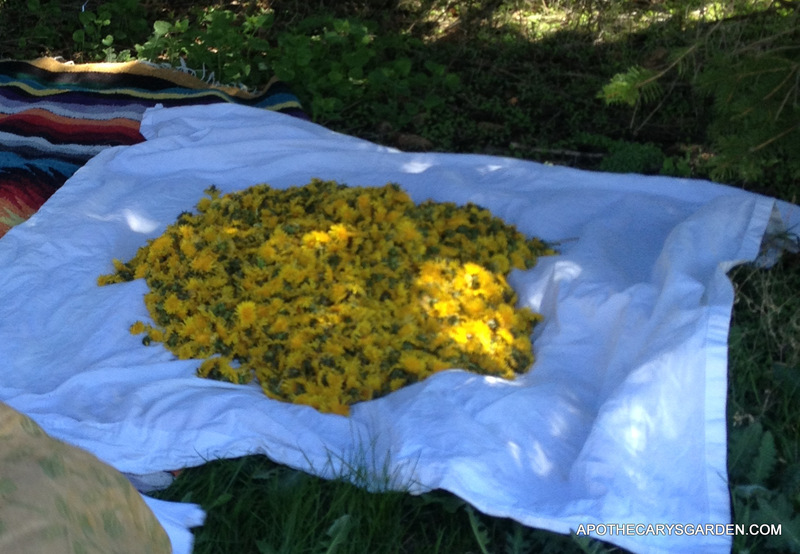 As I mentioned in my most recent post because I used 3 kg of fresh dandelion flowers it gave enough strength to the flavor that I could stretch it by a third without affecting the flavor. Though the color is not as intense as it was before adding the water, it is still a beautiful yellow color and the Dandelion flavor is very much intact. I will probably rack the wine two more times during its secondary fermentation. And in a month or so I will bottle it in sterile bottles with sterile corks, slap on some labels and put it aside until December.